Poster image is a time-lapse microscopy image of a cas5/cas5 mutant undergoing cell division, resulting in the accumulation of multiple nuclei within a single cell. Red is RFP-tagged histone H4 (nuclei) and green is GFP-tagged Dad2 (spindle). Fungal pathogens have a devastating impact on human health worldwide. They infect billions of people around the globe, and kill more than 1.5 million each year (Brown, Denning et al. 2012). The most vulnerable are people with reduced immune function, such as those with HIV or those undergoing immune suppressing treatments for cancer or organ transplants. One of the leading fungal pathogens of humans is Candida albicans, which is a leading cause of hospital-acquired infections with mortality rates often exceeding 40% despite therapeutic treatments (Pfaller and Diekema 2007). Treating these infections is extremely difficult, as fungi are closely related to humans and there are very few drugs that kill the fungus but not the host. Further, the increasing emergence of drug-resistant fungal infections is of serious concern leaving little or no therapeutic options for the treatment of some of these serious infections. Sensing the environment and coordinating appropriate cellular responses are challenges confronted by all microorganisms. Within its mammalian host, C. albicans has adapted to survive in several distinct anatomical sites, each with its own specific set of environmental pressures. To achieve adaptability, C. albicans has evolved sophisticated mechanisms of sensing and responding to environmental cues through the activity of key cellular regulators that result in coordinated changes in gene expression programs. These environmental sensors are often crucial for fungal virulence and for the emergence of resistance to antifungal therapies (Shapiro, Robbins et al. 2011). Given that drug resistant fungal infections are plaguing clinical settings, it is now critical to uncover novel cellular regulators that are required for the pathogen to survive and cause disease in order to develop new therapeutic strategies. Previous work identified the C. albicans zinc finger transcription factor, Cas5, as a key transcriptional regulator of responses to cell wall stress (Bruno, Kalachikov et al. 2006), however its function in the cell in non-stress conditions and the mechanism by which it was regulated remained unknown. Here, we discovered that Cas5 is a biologically responsive transcription factor that governs distinct transcriptional programs in response to different environmental conditions. We established that Cas5 regulates genes important for cell wall biosynthesis and DNA replication under basal conditions, however in response to cell wall stress it switches its targets to regulates the expression of genes required to survive the cell wall stress and to slow down cell cycle progression. In addition, we demonstrated Cas5 function is regulated by the protein phosphatase Glc7, and showed Cas5 functions in concert with other transcription factors Swi4 and Swi6 to regulate cell wall homeostasis. This exciting study illuminates a mechanism of transcriptional control that couples cell wall integrity with cell cycle regulation, and uncovers circuitry governing resistance to the cell wall targeting antifungal caspofungin. Since Cas5 lacks an identifiable ortholog in humans (Bruno, Kalachikov et al. 2006), but is required for drug resistance and virulence in C. albicans (Chamilos, Nobile et al. 2009, Pukkila-Worley, Peleg et al. 2009), it provides an attractive target for antifungal drug development. There is growing support for the feasibility of chemical modulation of transcription factors based on blocking transcription factor dimerization, DNA binding, or the interaction with regulatory proteins (Bahn 2015, Nishikawa, Boeszoermenyi et al. 2016). Future work focused on identifying the cellular kinase that inactivates Cas5 activity and other effectors that work with Cas5 to coordinate changes in gene expression will aid in the identification of other cellular regulators that could serve as potential therapeutic targets. The Cowen lab, University of Toronto, Toronto, Canada, July 2016. 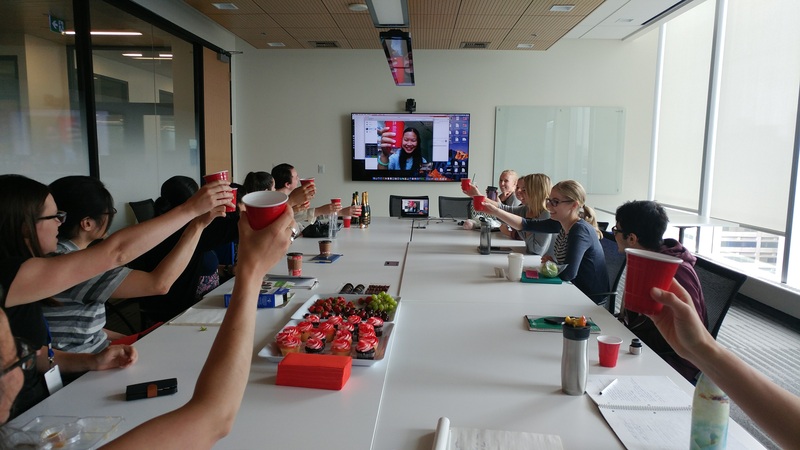 The Cowen lab and recently graduated PhD student Lucy Xie celebrating the acceptance of our manuscript in Nature Communications. Lucy is currently a Postdoctoral associate at Stanford. Bahn, Y. S. (2015). "Exploiting fungal virulence-regulating transcription factors as novel antifungal drug targets." PLoS Pathog 11(7): e1004936. Brown, G. D., D. W. Denning, N. A. Gow, S. M. Levitz, M. G. Netea and T. C. White (2012). "Hidden killers: human fungal infections." Sci Transl Med 4(165): 165rv113. Bruno, V. M., S. Kalachikov, R. Subaran, C. J. Nobile, C. Kyratsous and A. P. Mitchell (2006). "Control of the C. albicans cell wall damage response by transcriptional regulator Cas5." PLoS Pathog 2(3): e21. Chamilos, G., C. J. Nobile, V. M. Bruno, R. E. Lewis, A. P. Mitchell and D. P. Kontoyiannis (2009). "Candida albicans Cas5, a regulator of cell wall integrity, is required for virulence in murine and toll mutant fly models." J Infect Dis 200(1): 152-157. Nishikawa, J. L., A. Boeszoermenyi, L. A. Vale-Silva, R. Torelli, B. Posteraro, Y. J. Sohn, F. Ji, V. Gelev, D. Sanglard, M. Sanguinetti, R. I. Sadreyev, G. Mukherjee, J. Bhyravabhotla, S. J. Buhrlage, N. S. Gray, G. Wagner, A. M. Naar and H. Arthanari (2016). "Inhibiting fungal multidrug resistance by disrupting an activator-Mediator interaction." Nature 530(7591): 485-489. Pfaller, M. A. and D. J. Diekema (2007). "Epidemiology of invasive candidiasis: a persistent public health problem." Clin Microbiol Rev 20(1): 133-163. Pukkila-Worley, R., A. Y. Peleg, E. Tampakakis and E. Mylonakis (2009). "Candida albicans hyphal formation and virulence assessed using a Caenorhabditis elegans infection model." Eukaryot Cell 8(11): 1750-1758. Shapiro, R. S., N. Robbins and L. E. Cowen (2011). "Regulatory circuitry governing fungal development, drug resistance, and disease." Microbiol Mol Biol Rev 75(2): 213-267.